Chester Hays has been on the road for months, using his fiddle in exchange for a warm meal, playing to raucous crowds in the small country towns. Playing itself isn't illegal, but it's only official Songshapers that have studied at the prestigious Conservatoruim who are permitted to connect to The Song. Music is a form of sorcery in Chester's world, and without training it now makes Chester and target and puts his life in danger. Susannah is the leader of the notorious Nightfall Gang, known across the land for their thievery. Stealing from wealthy barons to give to the poor, the gang have been searching for an unregistered Songshaper to carry out their latest mission, to infiltrate the Conservatoruim. So when they Chester is captured and sentenced to death, Susannah's right hand man Sam saves Chester, leaving the young man in their debt. But Chester is on a mission of his own after his father disappeared, and Chester has been searching for him ever since. In exchange for his service, the gang promises to share the secrets of The Hush, and alternative world where stray magic looms and monsters called Echoes lay in wait. Susannah knows all too well what awaits Chester at the Conservatoruim, a suicide mission in order to reap revenge against those who have left her damaged. But as the two grow closer, can she hold the information Chester seeks to ransom, knowing he may never return? 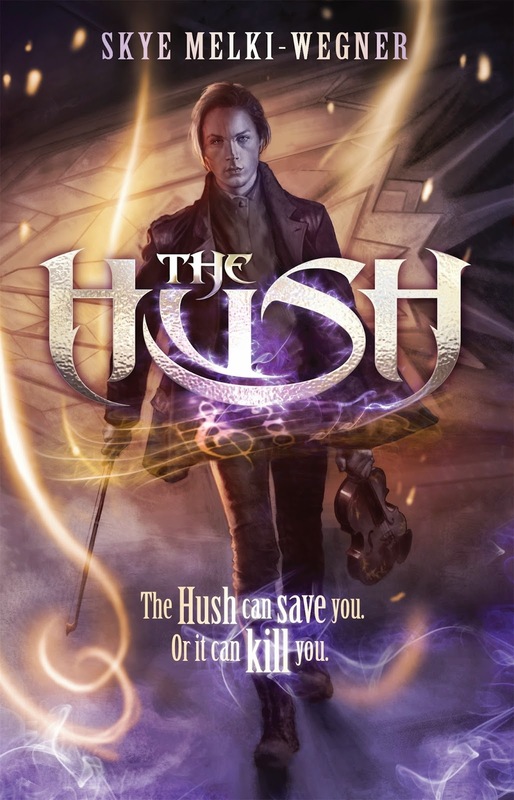 The Hush is a imaginative, engaging and enthralling fantasy, with elements of suspense and science fiction. Skye is one of my favourite authors, she creates vivid worlds in which readers can fully immerse themselves, likable characters and is an advocate for creating strong, but flawed heroines. She makes reading effortless and simply entertaining. Told as a third person narrative, it follows both Chester and the Nightfall Gang, Susannah, Sam, Dot and the fabulous Travis. They know all too well what the Conservatoruim is hiding, and plan on exposing their secrets and recruiting Chester for their cause. The world building is so incredibly vivid, switching from the realism of our world to The Hush, where sorcery creates a dark and dangerous landscape of rain and Echoes. A cross between middle grade and young adult, I was hooked from the very first page and was torn between flying through the pages and trying to savior the storyline. I simply loved it. Fabulously written, Skye is the ultimate Australian fantasy fusion author for the young and young at heart. Although the storyline delivers the reader with a satisfied finale, I would love to see The Hush continued in what would no doubt be an epic adventure series. At this point, I'd read this girl's shopping list. She's just that incredible. I'm all for epic adventure and all, but sometimes, I get overwhelmed easily with the world building. It sounds like this one features a world that's easy to follow. Thanks for putting this on my radar, Kelly! It really does Joy. I have the same issues with Fantasy, that's why I tend to steer clear of most unless they're more of a blended genre. But this is simplistic and really engaging, even middle grade lovers would enjoy this one. I don't think I know this author, but that's great you love her writing so much. I am definitely intrigued by this one now. I hadn't heard of it before. She's an Aussie and wrote one of my all time favourite series, Chasing The Valley. Brilliant yet uncomplicated and vivid fantasy fusion series. This is a standalone, so perfect opportunity to discover her work Lauren. I really need to read Skye Melki-Wegner, I have been meaning too but haven't gotten around to it yet. This looks irresistible! I love the cover and the premise. I've added it to my goodreads. Great review. Glad to hear you loved it, it looks like one I'd love too. She's absolutely brilliant Rochelle, one of my favourite authors. It's just a bonus her being an Aussie. I loved this one, but her Chasing The Valley series is still my favourite by far. She creates the most unique world with brilliantly thought out characters. Kelly, you know how I trust your insights so much. With that said, if you say this book is made up of epicness, then I'll gobble it up and will get this book as soon as I can ;) Although as this was published in Australia, I am not certain if I will be able to get a copy of it easily... Australian books and authors are quite rare to see in bookstores here in the Philippines, but god knows how much I want this one. And fantasy! Fantasy is like my baby, if you could adopt a genre to be your own. Haha. You should be able to snare a Kindle copy hopefully, if not, let me know and I can gift it to you once it's available here. It was all kinds of awesome, this girl could slap a cover on her shopping list and I'd read it. That cover...hmm not a fan but after reading your review you've definitely hooked me Kels! I've never read a Skye Melki Wegner book before but I love that she can create such strong characters as well as balance it with good world building and a fast and interesting plot. What a triple threat! Not all authors can do that!! Yay for Aussie authors, I'm so glad that more and more are publishing such high quality work! The cover is a little too middle grade and really doesn't do the storyline justice. A bit too dark and moody. But it's just brilliant. She's certainly leading the charge for awesome Aussie authors. I've not heard of this until now, though it does seem pretty good. I haven't read much fantasy lately, so it was refreshing reading this review. I'm glad to see that it was written really well and that you enjoyed it. Fabulous review! Thanks Krystianna. I was never one for fantasy, but after reading and loving Red Queen, I've been really getting into fantasy of late. This one is brilliant, hopefully it'll be released worldwide, everyone should have the opportunity to experience Skye's writing. Thanks Benish. I agree, the cover really doesn't do how fantastic this book is justice. Glad to hear you really enjoyed this one Kelly, I haven't had the chance to read any of her works yet but the world sounds really fantastic. Lovely review hun! You must Jeann, she's incredible! Her Chasing The Valley series was absolutely phenomenal and this one is a great standalone. Can't wait to see what she comes up with next. I wasn't either until recently, after reading Red Queen, now I've got a taste for it. This is a pretty mild fantasy though, more so a fun middle grade read.